If you are in the market looking for a solid 4GB USB Drive, Buy.com has a 4 GB Kingston DataTraveller USB Drive for $24.95. If you sign-up for a (free) new Google Checkout account, you can get it for $14.95 with free shipping. This is the lowest I have seen for a 4GB USB Drive and Kingston makes some really good ones. Even if you don’t need one, it could be a nice Christmas gift. Or, you could get a 2GB Kingston DataTraveller USB Drive for $14.95. 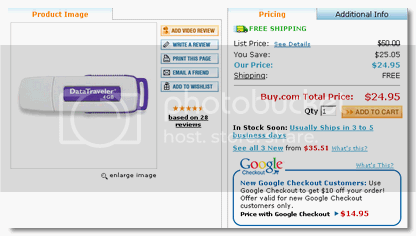 With a new Google Checkout account, you could get it for $4.95 with free shipping! If you are wondering, what you could do with a USB drive, check out my 12 Must Have Portable Apps for your USB Drive for some ideas. If you are into finding nice tech deals, check out the right most sidebar from Buxr. I have started to keeping an eye on it as they are pretty spot on in deals like the one I have mentioned here. This is not a sponsored post or am I asking you to click on those ads but this has to be one of the most useful ad widgets I have ever had. It’s Thanksgiving week here in the US next week and I will be posting lightly next week. I have scheduled a few posts to go live next week when I am away but I will resume my regular posting once I get back after the holidays. Hehe…something tells me you have a nice personal collection of these things lying around the house. 😀 You guessed it buddy! I try not to post about USB drives anymore but a 4GB drive for $14.95 is something I could not stop myself from telling everyone! Great deal! I need one of those actually…though I wish they had a deal on the 8GB ones! @Troy.. glad you like it!